Recently, I traveled to Yosemite National Park in search of inspiration and a pre-visualized image, something Ansel Adams did 87 years before me. It can be said that “Monolith” is Adams’ most important image. The pre-visualization he imagined, coming to life in print, provided a process for making the rest of his portfolio. I have always been inspired by Ansel Adams. His work and his writing have always pushed me to learn my craft, to closely watch the ever-changing light around me, and to visualize the feelings and emotion that pushed me to click the shutter. This process of pre-visualization is easily spoken of, but difficult to learn and put in practice. I work on it constantly by shooting with other photographers I greatly respect and share similar motivations in this field. 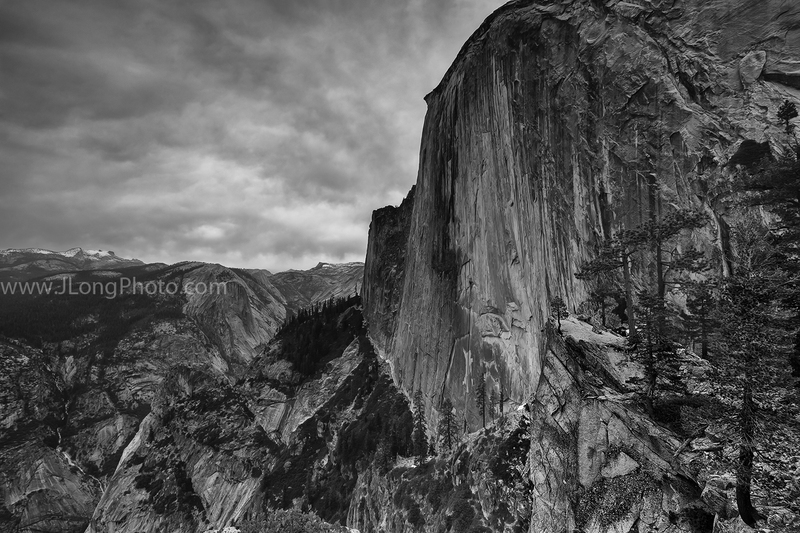 My adventure to the Diving Board involved two different trips in order to capture an image that captured the true beauty and emotion of one of the greatest views in the Sierra Nevada, Half Dome. I was invited by my friend Matthew Kuhns (www.matthewkuhnsphotography.com) to join professional fine art photographer Jeff Mitchum(www.jeffmitchum.com) to the Diving Board. Jeff was searching for an image he has had in my mind for twenty years and I was there hoping to capture some of the emotion I felt standing where Ansel once stood. The hike began at Happy Isles and followed the Mist Trail past beautiful Vernal Falls and Nevada Falls. The trail quickly climbed in elevation until we reached the Little Yosemite Valley about four miles in. I was carrying a forty pound backpack, making the hike strenuous, but the views of both Vernal and Nevada Falls made the journey worth the pain. From Little Yosemite Valley, we had approximately two miles left. Unsure about water availability from this point forward, I decided to refill directly from the Merced River. The journey ahead would follow a seldom-used trail to the Diving Board. The hike from Little Yosemite Valley to the best of the west shoulder of Half Dome was fairly flat. It passed through a beautiful forest, a stream, Lost Lake, and a lovely meadow with the back-side of Half Dome high above it. We located rock cairns that pointed up in the right direction to the base of the shoulder and we began the steep ascent to the top. The trail was faint and difficult to find. It was an extremely strenuous climb. At a flat spot about 200 yards below the Diving Board, we stopped to eat lunch and take a much-needed thirty-minute break. I took a quick nap. After eating, we pushed to the top. Halfway up this final ascent, the view came in to sight. It was but a preview of what was to come. Once on the Diving Board, the view of Half Dome is simply amazing. I almost felt I could reach out and touch this massive piece of granite. Looking West down the Yosemite valley I could see Glacier Point, Yosemite Falls, and El Capitan. Ansel Adams was correct; this is one of the grandest views in the Sierras! After taking in the scenery and waiting for good light, we decided to leave without the image we were looking for. The clouds were thick and blocking any chance of sunlight coming through. It was close to 6 P.M., which meant we would be hiking down partially in the dark. We made it to Little Yosemite Valley before sunset. From there, the trail is much easier to follow in the dark. It was fairly easy to finish the rest of the way down except for a few slipper rocks and some steep downhill sections. Even though I didn’t bring home the image I wanted, it was a great experience. A few days after getting home, I receive a message from Jeff saying it was time to pack our stuff and head back up. The weather appeared to be shaping up nicely for May 4. Jeff opted to use some pack mules because this time, we would be camping. The mules would bring our gear to Lost Lake. The hike began early in the morning with Jeff Mitchum, several new friends, and me: Abe Blair (http://www.blindmanphotos.com), Kevin Herman, Eric, and climbing legend Richie Copeland. The mules would be a blessing and a curse for me. We made it to Little Yosemite Valley quickly and rounded the corner towards Lost Lake to meet the mules and haul our gear up the final section. Unfortunately, due to downed trees blocking the trail, the mules had to drop our gear about .75 miles before the expected location. I loaded up my backpack and daypack. It was incredibly heavy, approximately 80 pounds. In addition, we still had the hardest section of the hike in front of us and it was really steep. After hiking about a mile, I decided to leave half my gear on the side of the trail and come back to get it after I set up camp. That was the best thing I could have done. The hike to camp with just half my gear wasn’t too bad. Once I set up camp and ate some lunch, it was time to head back down the trail for 30 minutes to pick up my camera gear. I loaded it all back into my backpack and headed back up to camp. All told, it took about ninety minutes. Not long after getting back to camp, one more friend joined us, John Degrazio (http://www.yexplore.com). He was just in time to head up to the Diving Board with us. We all set up our cameras hoping for good light. 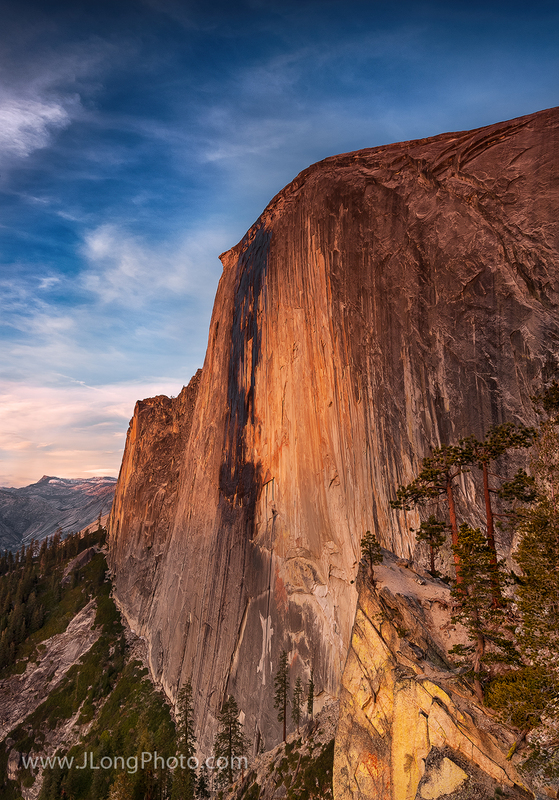 I watched the light dance all across the crags and features of the face of Half Dome. I imagined different compositions before I decided the one I would be using. By that time, the sun was disappearing behind some clouds. I feared the same fate as only a few days earlier. I patiently waited for what seemed an eternity to see if the sun would make one final appearance. We were elated when it did, although we had only about 15 – 30 seconds of good sunlight poking through. A great photographer is ready for that quick moment. I fired off several images feeling I captured exactly what I had visualized. After the light vanished, all five of us were high-fiving each other and reliving the moment. That night, we sat around the campfire telling stories, eating great food, and drinking hot chocolate. We were still on a high from the images we all just created. Just like Ansel Adams in 1927, we were carrying the inspiration and emotion of the moment from visualization to the print. Monolith helped jump-start his career, and I hope that this unique moment will carry me and my friends to further heights in photography, now and into the future.